Why “Initial amount upfront” is absolute Must in Web development. Why “Initial amount upfront” is absolute Must in Web development. Why “Initial amount upfront” is absolute Must in Web development. Alright folks, Many of the web development companies, mostly Mid Sized Companies fret on the idea of asking “Initial payment” to their clients. Well, Admit it. One of the powerful reasons for that could be Low self-Esteem. Familiar? 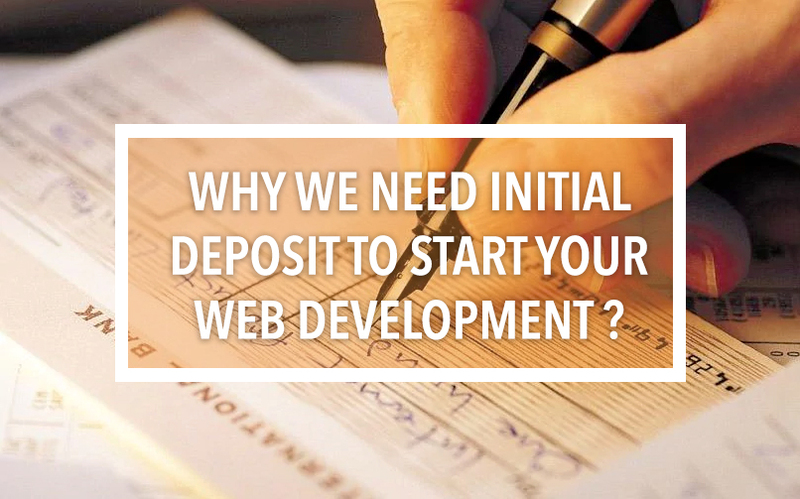 Now hop on to read Why Initial payments upfront is an absolute Must in Web design and Development. Lets your Client Invest effort as much as you Do. Its undeniable fact that money pays a prominent role here. When you start a project without any upfront payment, chances are that the client is least interested in whatever you bring on the table, expects more creativity without appreciating your efforts and time, becomes disinterested and finally disappears in thin air. No amount of agreements will help you fetch the lost time and enthusiasm once you feel that the efforts are wrongly placed. With Deposits , you are assured that the client gives you equal efforts and feedback timely to make you handover the project on the right timeline. Believe me, the level of client engagement elevates drastically, see it to believe it. Expereince this with payment and without payment for your next project. Oh yes, All the best for your efforts!! It happens to the companies/freelancers who bend down the knees to appeal a client. Common guys, you are expert in it and you know how to do it efficiently. Have your confidence intact and tell your client the right way that the asked things could be/could not be done. The right attitude is important when dealing with projects like design and development of websites. Irrespective of how beautifully you strategize, its inevitable that the design projects go smooth and get hanged during approvals and feedback. There are disagreements, changes and lot of hoax before it makes its way to LIVE. When you embark on this journey without initial payments, you might end up getting the best shockers of your life from the client saying he did not like the project or its not that he was really looking for. It not only gives you huge hit to your pocket but also end you up paying the other task masters( developers/designers/writers) for their efforts (from your pocket ofcourse!). Keeps you motivated to give your best as the client is on your back. A loud cheer to all those who got the business right at the first time. Well, We at Inovies have been there, Done that. We learnt everything by experience. A huge shout to all our clients for their Best understanding of our efforts and very sensible in their approach. We developed an understanding that the Client also gets in to the art of design, development, graphics, writing and every phase of the project once he invests money. He seems to be learning all the terminology, as he ensures working with you and be in tangent with you to complete the project and add value to his investment. How cool is that!! This in turn leads you to guide him, educate him and give your best possible efforts to make the output more appealing and of greater value. And that’s we call a WIN WIN. Now its your turn to draft your horror fables/success stories of the strategy you feel is apt. You are welcome to have your views presented, Come lets share and learn together.